Home » News » Hope. Opportunity. Success. Marina Vinogradova has just come back from Europe after performance on international competition. Germany, France, Italy, Holland – almost month and a half of removals, starts, exhausting heat and permanent work. Marina is 36, last 8 years she has been confined to a wheelchair: after the birth of second child, she was diagnosed with an awful disease – sclerosis disseminata. This disease has almost no remission; it is just possible to slow down the process of organism destruction. Unfortunately, she was overcome by attendant diseases – cancer of thyroid gland and anaemia. Marina had a successful performance on the Russian Championship in 2014, but she understood that she had no opportunity to go on. 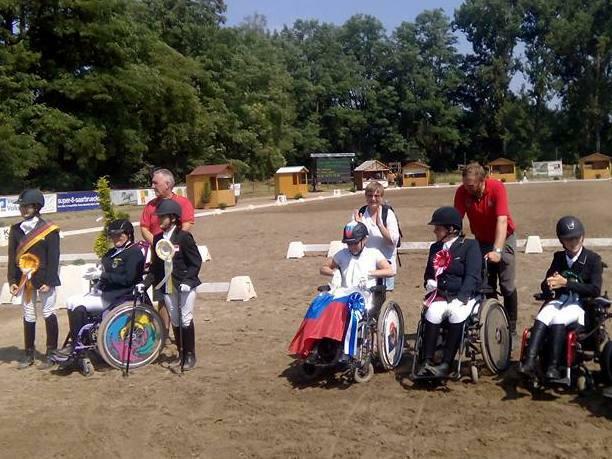 The next step is receiving a license for the performance on the European Championship and a trial to take part in Paralympic games in Rio-de-Janeiro. Marina had no horse and no financial support for this. To receive the license you need to go to Europe with your horse on your own account. Junior horse-club “Belka” gave one of the best horses Silve-le-Andro to Marina. At once Marina found a common language with the horse and she became a Champion of Russia in 2015. A chance to get to the Championship of Europe was given to her by holding “Belaya Dacha” and interregional social movement “Rus Pravoslavnaya”. Only due to financial and moral support Marina got an opportunity to take part in several international competitions. And she did it! Marina had a great performance, was a prizewinner several times and got the license for participation in the Championship of Europe in France in September. And it is very possible that a dream about Paralympics in Rio comes true! Ivchenkova Irina has been confidently moving to the victory – several years of exhausting trainings and hard work. In 2015 Irina became a winner of Russian Championship in triathlon and was included in Russian team for participation in European Championship in Poland. The main financial support was provided by Russian Minister of Sport, but not total. Holding “Belaya Dacha” decided to help Irina. Possibly, triathlon is the most difficult discipline of horse riding. Competitions are held during three days: the first step is a test on controlling a horse, the second is cross - overcoming obstacles, including water obstacles, the last is jumping - overcoming obstacles in manege. It is a great achievement to become one of the best in triathlon. We believe that Irina’s start in Poland will be successful and we wish her good luck! Nadezhda Mikhailova won a Russian Championship in remote horse running in 2014. In her 16 she took the win away from grown and skilled sportsmen, passing 16 km distance quicker than others! In 2015 Nadya has a qualification on participation in European Championship in remote horse running in Slovakia. She has a qualification, but she has no financial support. Again, holding “Belaya Dacha” and movement “Rus Pravoslavnaya” has provided support to young sportswoman. On the 30th September after Russian Championship Nadya will go to Slovakia with her trainer and faithful horse Karabah.